steps to ensure that President's rule was imposed in the state in the run-up to assembly polls. He took exception to Rao saying that legislative assembly polls would be held in November as the schedule of elections was an important announcement to be announced by the Election Commission. Telugu Desam Party's Telangana unit president L Ramana, Communist Party of India state secretary Chada Venkata Reddy, Telangana Jana Samithi (TJS) leader M Kodandaram were among leaders who met the Governor. Earlier in the day, Congress, TDP and CPI held preliminary talks to evolve a 'grand alliance' for the coming Assembly elections in the state. 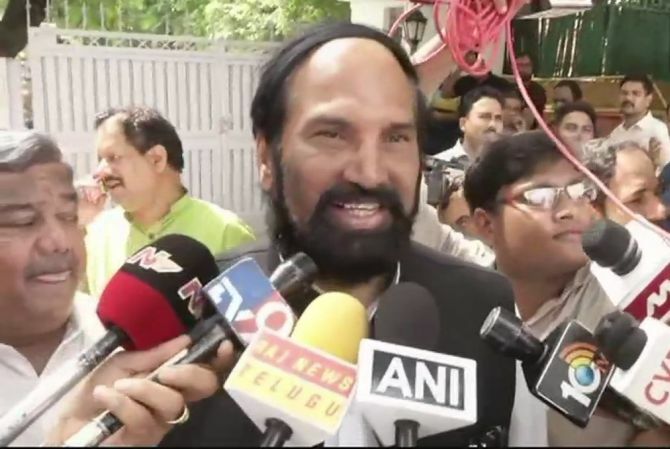 TPCC president Uttam Kumar Reddy said his party has given a call to all political parties and non-political organisations to join forces with Congress to end the 'misrule of KCR family'. "Accordingly, as a preliminary discussion, Congress, TDP and CPI met today. We call upon all parties and all people's organisations, civil society organisations, students associations, women's groups, who wish the interest of Telangana, to join forces," he told reporters. TDP Telangana unit president Ramana said they favoured a 'grand alliance' for the elections in the interest of Telangana people. Alleging that democratic principles suffered a 'setback' during TRS rule, CPI state secretary Chada Venkata Reddy said the parties favoured a 'grand alliance'. However, the assembly was dissolved last week as per a recommendation made by the TRS government. Meanwhile, kicking off the poll process for the Telangana assembly, a team from the Election Commission held formal consultations with representatives of various political parties in Hyderabad on Tuesday. The team, led by Deputy Election Commissioner Umesh Sinha, also held discussions with Telangana Chief Electoral officer Rajat Kumar, official sources said, adding that the EC officials would hold consultations on Wednesday with state government officials to assess the preparedness for the polls. The Bharatiya Janata Party, in a memorandum submitted to the EC, said that as per the Election commission's revised schedule,draft voters lists of all 119 assembly segments in the state needed to be made available to all political parties by September 10. He said they pointed out out to the officials that the caretaker CM has been claiming that he consulted the constitutional body on elections, which is against the rules. TRS MP Vinod Kumar said they requested the EC to conduct elections as early as possible as the caretaker government can not be functioning for a long time. The Majlis-e-Ittehadul Muslimeen requested the Commission to keep in mind various festivals while undertaking voters' registration. They also requested the EC to conduct the polls in a single go. The Communist Party of India-Marxist informed the EC that some pages of the website for registration of voters were not opening properly. It requested the EC to conduct demonstration of EVMs in the presence of all political parties to clear apprehensions, if any. The CPI alleged that Rao dissolved the assembly prematurely without any valid reason, putting a burden of 'hundreds of crores of Rupees' on the exchequer for conducting elections.